Making a wrapped loop is one of my favorite wire working techniques, nerd that I am. Read on to learn how to make one. Security!My wrapped links will never come apart and my charms will never fall off. Hand Wroughtedness. Yes I know that's not a word. But I still like the hand-wroughtedness of the wrapped loop. The Un Nameable Quality. For some reason it just makes me feel good. I'm not sure why. Maybe because I don't have to measure? I like to WOTW (work off the wire) if I can. Working off the wire means not cutting the wire first before using it. WOTW, grab the wire with your round nose pliers. 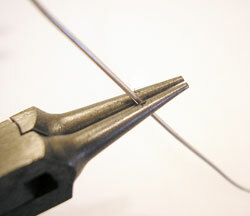 Tip: Mark your pliers with a permanent marker as a guide for wire placement. This will help you make uniform loops. 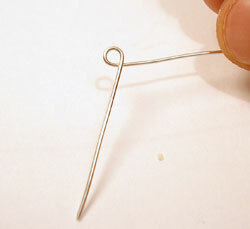 Using your fingers, wrap the wire around the jaw of your round-nosed pliers to make a loop. **If you are attaching this loop to something that does not open and close (like a charm) this is the time to hook whatever it is onto the newly formed loop. Hold the loop with your chain-nosed pliers and wind the wire around it at least three times. Trim the end with your flush cutter and tuck it down with your chain nosed or crimping pliers. (I like the front part of my crimp pliers because they are already rounded). Use your pliers as necessary to straighten the loop.